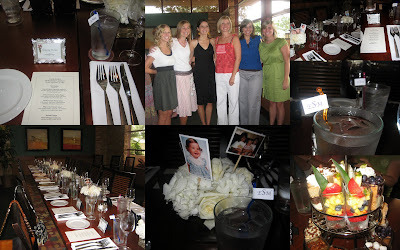 I helped my grandmother put together a ladies luncheon for my cousin and her bridesmaids the day before her wedding. My cousin is very simple but I wanted to incorporate some personal touches. I did pictures of her growing up along with pictures with her bridesmaids - I added them to the centerpieces. I also did her monogram on stirrers in every water glass. We had lunch at Season's 52 in Orlando.